Yeah you read that right. Food in vans has come a loooooooong way since the "grease served in a bun" era. Mobile wood-fired pizza ovens, proper burgers, pulled pork, burritos...street food has well and truly gripped the nation. But Cin Cin is different. I've yet to come across Prosecco and Italian antipasti served up from a van (and a charming 1972 Fiat 900T* at that) before now. 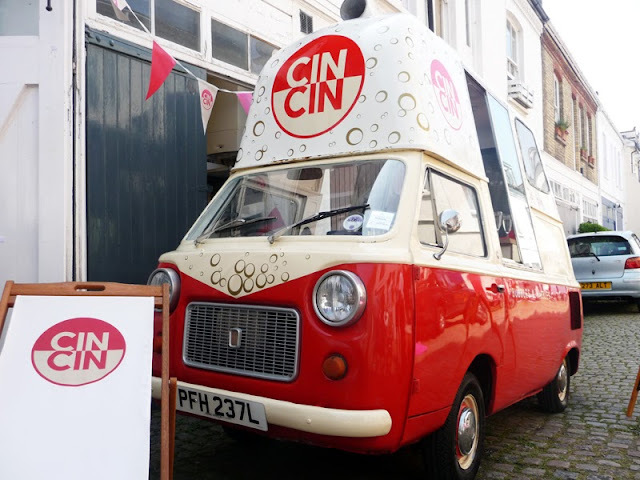 Cin Cin–that's cheers in Italian–launched just this week and is run by an Italian heritage husband and wife team. Sourcing decent Italian produce and wine, the offering is simple, elegant and fun. 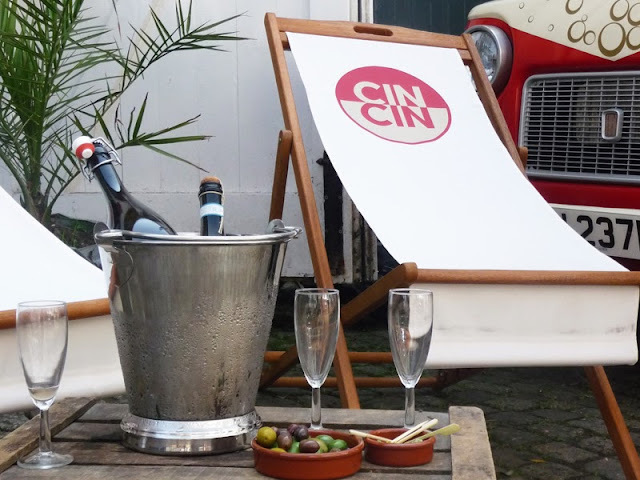 I just love the concept of Cin Cin. Shame it isn't operational and parked permentanly outside of my house I say. It is however available to hire for events and will be serving at festivals and things like Street Diner around the Brighton area. This would be a real talking point and something a little different for weddings and even corporate functions. Had me and Mr Graphic Foodie got married here instead of Italy we would have had to get these guys in to serve the aperitif for that bit of Italian charm. As most people are now familiar with Italian cured meats and olives it would be good to see them offer some more unusual produce like Baccalá (preserved salt cod), 'Nduja, Caciocavallo (one of my favourite cheeses) or Lardo. I like things like deep-fried stuffed olives with my aperitif and preserved octopus can look pretty stunning too as well as cutting through the small talk at functions. What I did try at the launch though was beautifully presented and great quality. Most people wouldn't have tried mortadella outside of the sweaty supermarket packets, so nice to see it here in thick cubes with giant caper berries. I loved the Pecorino (one of my favourite cheeses...again) with the lemon marmalade and Arancini are always a crowd pleaser and so versatile with what you can flavour them with. Fricking good olives too. With the sun shining, and wine flowing, I could have quite happily grazed all afternoon. I could also see them offering a dessert course service as there are plenty of great Italian pastries and desserts that transport well and can be washed down with some fizz too. In any case, if they get the word out I have a hunch that this is going to do rather well. To hire or see where Cin Cin is appearing, check out their website www.cincin.co.uk. 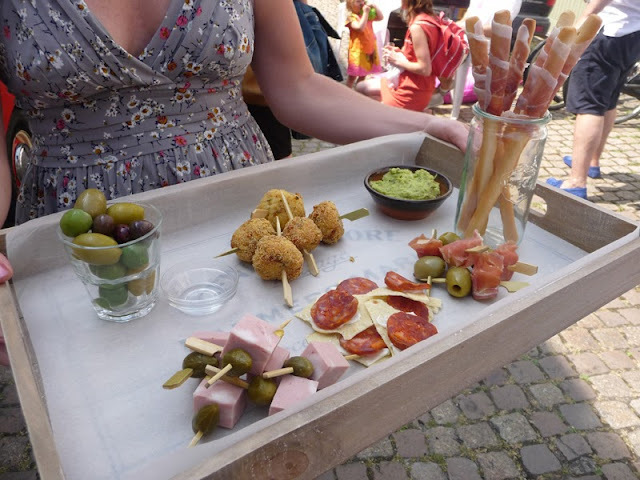 Their next pubic appearance will be at Street Diner in Brighthelm Gardens, Brighton on Friday 26th July and Bank Holiday Monday 26th August, where they will be selling antipasti snack boxes and giving away taster samples of their Prosecco. *I think. Correct me if I'm wrong, which is possible because this is a food blog not a van blog.